Im a Fan of Vivid Dental... Are you? Fill in the below form and you can recommend ‘Vivid Dental’ to a friend or family member via a text message. Show your support with a quick share of ‘Vivid Dental’. I came to Vivid dental terrified from previous experiences at other places. The team at Vivid is very welcoming, honest, and very safe. I was shaking from fear during beginning because of preset fear but by the middle of the job I was very calm and relaxed knowing I was in great hands. Very nice people . And comical at times. Will be coming back for all of the work I need done. Excellent practice! Everything went smoothly..setting up the appointment..getting set up to do the procedure..and the actual procedure itself. My feelings seemed to be at the top of the list of concerns! With so many options everywhere, is very hard to find the right place. At vivid Dental, I found caring people, great work, reasonable prices and phenomenal facilities. 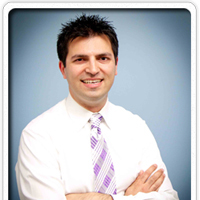 Dr. Harpalani is very dedicated to each patient and Mayte makes each visit an enjoyable experience. I stopped looking for a dentist when I meet Dr. Harpalani and his team at Vivid.